This morning, we slept in a little bit, and then I ran some errands. I made a post office stop, and then picked up a new 30-amp extension cord and a new 50 - 30 adapter, so we can plug our 30-amp rig into a 50-amp outlet if necessary. I think our old extension cord was the problem in our last attempt, so we'll be ready to try it again the next time circumstances arise. I also got the Jeep washed. 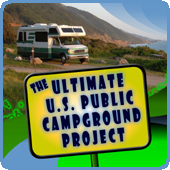 We now have first-hand experience on just how dirty "toads" get behind motorhomes. Even with the screen we have, the Jeep was filthy, and it looks like it may be a losing battle trying to keep it clean until we sit for a bit. 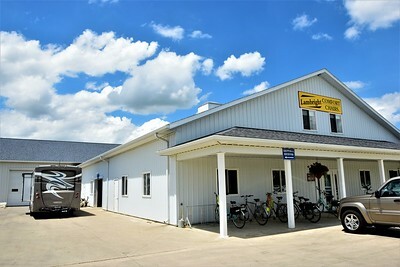 We pulled out of Elkhart County 4-H Fairgrounds around 12:45, and made the half hour trip to Lambright Comfort Chairs south of Shipshewana, IN. Their address is actually 1150 S 700 W, Topeka, IN 46571, but they are closer to Shipshewana than the town of Topeka. I drove the Jeep and Linda followed in the motorhome. I went inside and then Vernon showed her where to park. Our theater seating, Lambright Luxe Theater Seating, was ready today, May 30, as promised to us over a month ago. Vernon went right to work, taking our dinette out. This is the "before" picture. One bench out, and getting ready to remove the other. Vernon and his son, took the benches and table out the door rather easily (after temporarily removing the hand rail by the door). Under the benches were seatbelts bolted to the floor and wiring for the slideout. The new furniture would cover all of that, so we didn't have to re-wire, and we didn't have to remove the seatbelts. In fact, we'll be able to use two of the seatbelts with the recliners, so either of us can safely sit while going down the road. They brought the unit in in pieces - first the bottoms of the recliners and the console that fits in between. 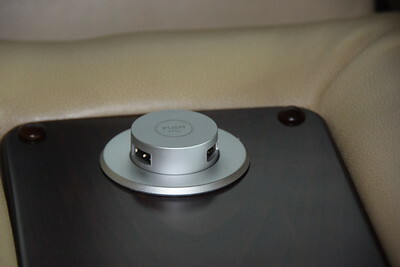 The recliners are electric, and the center console has a pop-up USB charging station with two ports. So, Vernon connected the base pieces and hooked up the electric. We turned on the inverter and made sure everything worked so far. Then, after making sure it was positioned where we wanted it, he secured it to the floor with screws. Once that was done, he put on the backs of the recliners and connected them to the electric. The headrests are also electric, so they can be adjusted with the push of a button. Again, we tested them to make sure they were working. Power headrests are a recent addition, and I'm a big fan. 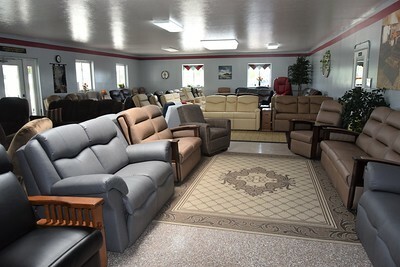 Finally, we added the tables to each recliner. They are optional fold-down tables that we will use for eating and for sitting our laptops on when we get up. They can be swung over the seat, moved to the side, folded down, or removed completely. The next several photos are the various configurations. Console in the "up" positions with tables swiveled to the sides. Console "down" with tables swiveled over seating. 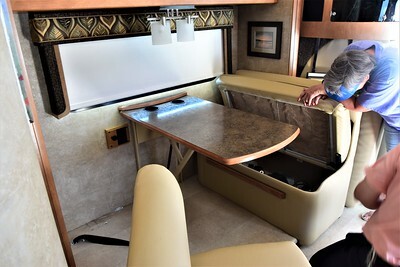 Console down with drinks in cup holders and console drawer open with laptops on the tables. The inside front of the drawer has pouches for three remote controls or remotes and glasses cases. One recliner in full recline position. 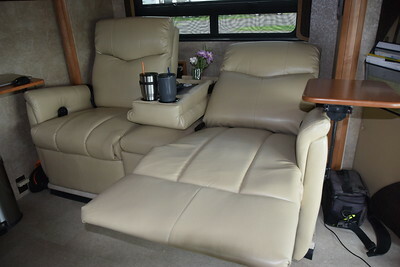 Full recline with table folded out of the way. We'll likely remove the tables completely for travel. The new furniture is a great match to the bucket seats. There is a little lighting difference in the photo, but they are almost exact in color. You may have noticed that the controls are on the inside of the recliner arms. Knowing we wouldn't have much room between the chairs and the walls, we opted for the inside control position. So, there are two buttons for the recliner control and two buttons for headrest control. We set the seating on the front edge of the slideout platform, so we still have some good storage space behind the unit. 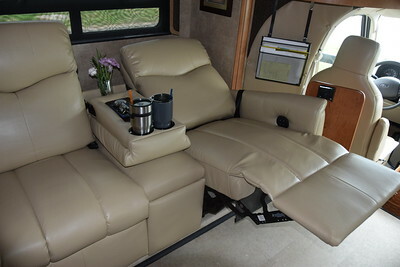 And they can be fully reclined with the slide in. 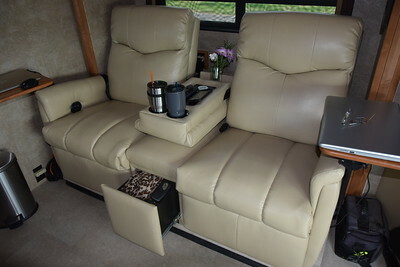 Ah, now we feel like our little motorhome "cottage" is complete with this added combination of comfort and function. We're quite happy. Thanks to Vernon Lambright and Lambright Comfort Chairs. And you can click on the coupon below, print it, and take it into the showroom for a little discount. Here are a couple of photos of the showroom. 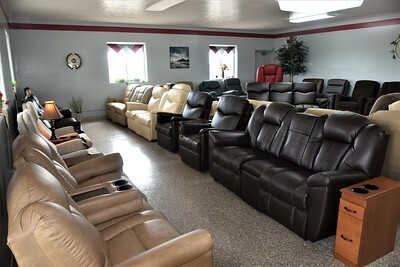 They have a lot of different options in sofas, loveseats, chairs, recliners, theater seating, and more. 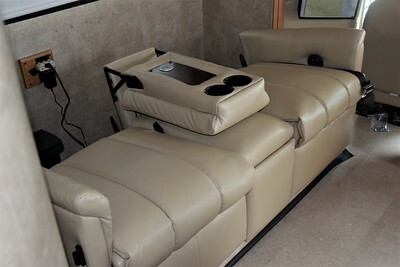 Top RV manufacturers like Newmar, Tiffin, and Entegra have been offering Lambright Comfort Chairs furniture, but Vernon recently decided to discontinue supplying to all manufacturers because he prefers to deal with his customers face-to-face. He does sell through a few retailers, but I prefer to work directly with Vernon and his family. 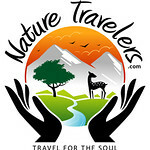 If you call or stop by, tell him Howard & Linda at RV-Dreams sent you. Nice! Very functional looking furniture. Congrats! How close to the wall are you able to place the chairs? They look great! I love it , great idea! Maybe you two should design some RV's! We got ours in April and love it! 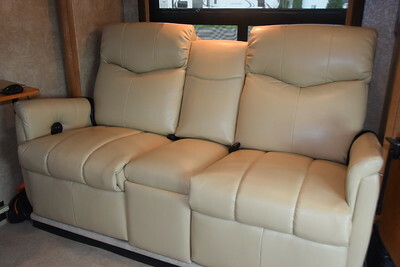 Vernon was able to put the smaller arms on it so we could fit a longer sofa recliner in the space. We got a battery supply for the electric recliner, it just recharges. We haven’t had to recharge it yet, he said it will go for several months. That way we didn’t need to add wiring. What a wonderful company to work with! What a wonderful change! They look so comfortable. Enjoy! The seating looks great and seems so functional! We had plans to replace the sleeper/sofa in our Newmar with theater seating or recliners - you've convinced us to go with the theater seating. I'm going to call Vernon this fall and set up an appointment when I'm in Northern Indiana early next year. Thanks for posting these pictures and explaining the process. Rebecca, Yes, 32 oz. They are Yeti knock-offs from Walmart. 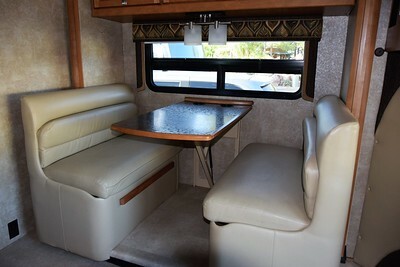 Looks nice....how did you arrive at your decision to replace your dinette? 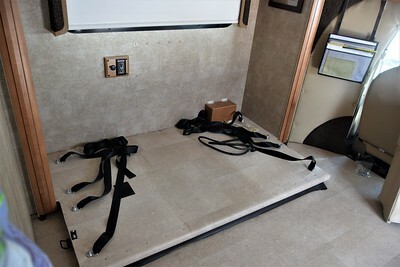 I'm still surprised you sold the Fifth Wheel when it was perfect, comfortable and efficient. I guess change is good.....and nothing but the best for you guys. Hope to see you on at Nancy Lopez soon! In our transition to downsizing, we wanted to go as small as we could, but still have comfortable seating where we could work, eat, watch TV, take a nap, etc. 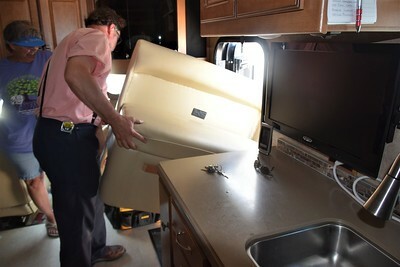 In even considering a Class C, our intent was always to remove the dinette. 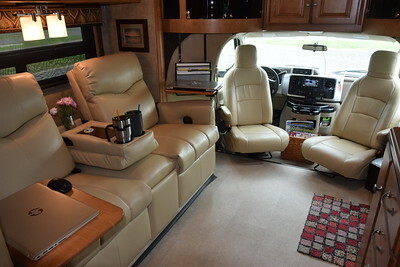 We're still living in the RV so comfort is way more important than a dining table. 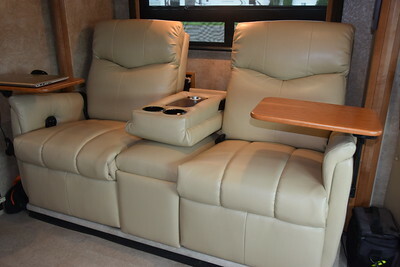 The theater seating was the best way to get comfort and function in the same space as the dinette. We saw Vernon yesterday and purchased almost the identical set up for our rig. Thanks for doing the leg work for us!